Originally called Lee Town, Stanford Township was organized in 1869. Like Athens, it is an odd-shaped township, having as its border on the east, the Rum River. Thus, those sections in Range 24W are referred to as East Stanford, and there is a separate index of landholders for those sections. Stanford’s first settlers were mostly of German descent who settled in the vicinity of Crown, establishing a German Lutheran Church and parochial school. Some of the early settlers were the Stoeckels, Hasses, Kriesels, Lemkes, and Wittlefs. Stanford Township boasts the largest number of Century Farms in the county. Some of the other names associated with early settlement in Stanford Township are the Engrens, Claysons, Danefelzers, Lindmans, Jobes and Schwabs. 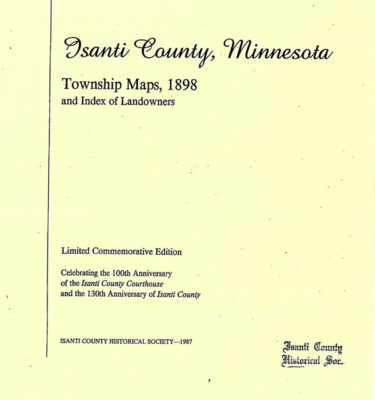 In 1898 no bridge yet crossed the Rum River so residents of Stanford Township were forced to travel north through Bradford and cross the river west of Old Isanti in order to conduct business at Cambridge. St. Francis and Anoka were more convenient trade areas for the Stanfordites.